Considering the name I’ve taken for this blog, it’s no surprise that I enjoy watching people suffer by their reaping the results of their willfully ignorant choices and claims. I like to watch people who insist that they are so pious that no one can question their actions fail in their claims of divine perfection and divine protection. I like to watch people who claim that their opinions are the objective will of the some magical omnipotent being tear their clothes and wail piteously when their opinions are thrown into the dung heap of history as nothing more than very human ignorance and hate. There is no shame in applauding when willful ignorance and hate fail. This is why I am happy that the folks in Ireland stood up against the ignorance that has been fostered by religion, especially the Roman Catholic Church, for so many years. They have cast away the fear that religion has tried to shackle them with and embraced their fellow humans. I take pleasure in watching the excuses and complaints flow from those who would insist that anyone but them is less than human. They’ve failed again and I am happy for that. This is why I am happy that secular law has been used to show the hypocrisy and harm that religion can do by the revelation that the hyperpious Duggar family is anything but good and honest. I am deeply unhappy that humans can be so harmed by religion, in this case all of the Duggar children, because they were told that they and only they were right and “right” means that women are less than human, and believers are above justice and responsibility. These actions and the constant problems that religion has with abuse of other shows that religion makes no one good and religions’ gods do nothing. If only religion was decent and humane, and no one had to be hurt and be an object lesson in how faith fails. That is not the case. This is why I’m happy that the idea of “reality” TV shows that are no more than a reincarnation of freakshows are under fire. Everyone who watches such shows is complicit in rewarding such behavior. I do not feel a sense of schadenfreude for those who are hurt through no fault of their own but for those who now are displayed as hypocrites, who caused harm to themselves by their own actions. I do condemn those theists who lend their voices, tacitly or vocally, to the belief that religion and their faith is some holy cow that can never be questioned. The little good religion does can be also found in other sources. Countering religion may not remove all of the harm in the world, but it can get rid of some of the most pernicious sources of it. Incidentally, both instances show that prayer is rather pointless. How many prayers do you think were offered up for God to change the vote or for the abuse to stop? This is Pussyfoot, a Warner Brother character that I find far too cute. I just finished Jerry Coyne’s new book “Faith vs. Fact”. It was a great deal of fun to read, even though I know, and have used, most of the arguments in it. Dr. Coyne does an excellent job of stating a premise, carefully defining terms, and then proceeding to support it with evidence, likely a habit gained from writing research papers. One of the parts I liked best about it is the plethora of quotes presented, a fair number that I had not encountered before. I would recommend it to anyone who wants to have one quick resource on how to respond to theist claims of evidence and to accomodationist claims that there are no real conflicts between science and religion. Each claim and excuse is carefully dissected and addressed. Dr. Coyne does an admirable job of showing how pussyfooting around the contradictions and baseless claims of religion does no one any good in clear straightforward language, and with no apologies for showing the emperor has no clothes at all. In addition, there’s almost thirty pages of notes and references, something I love for any nonfiction book. I’d like to make an offer to any of my theist readers that if they agree to read “Faith vs. Fact”, I would agree to read a book of their recommendation. We could both then discuss the books. Of course, a discussion will quickly reveal if the books were actually read or not. As I was reading this book, I have been discussing religion with some of its adherents. 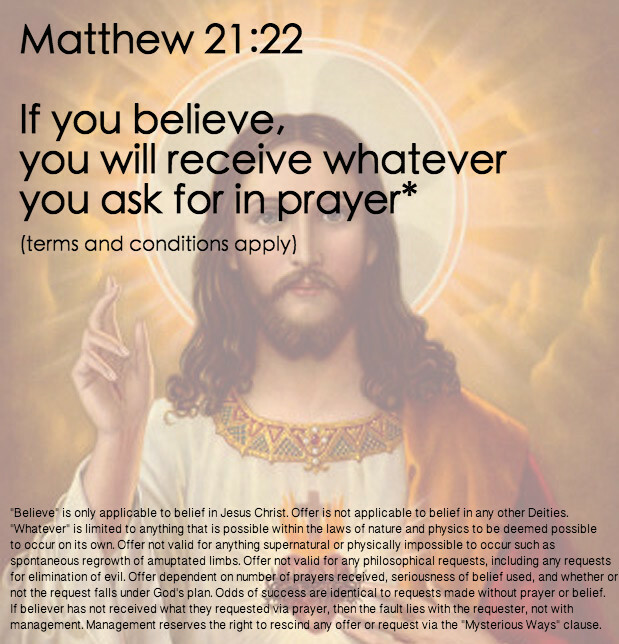 Over at the HessianWithTeeth blog, Hessian wrote about how many Christians want to tell non-Christians “just believe”. A Christian, Skinbark, came on to say that other Christians are wrong for saying that and that “real” faith depends on “solid understanding” of this person “God” because the bible said so. This is a good example of the problems that Dr. Coyne explores when comparing faith with fact, especially when it comes to what faith means to a believer and what “God” means to a believer. Christians cannot agree whether they want a “person” as their god, intimately involved with every aspect of their lives and having definable goals and desires, or the vague deity that can’t be pinned down. Unsurprisingly, when asked why other Christians didn’t agree with them and where exactly did the bible say understanding was important, Skinbark responded in that time honored fashion, accusing anyone of asking questions to not be truly interested in the answers, so they don’t have to provide any. Hello! Finally getting a chance to catch up on posts about food, alcohol and other things. I do get wrapped up in commenting on other blogs and sadly neglect my own. Current blog commenting is with a Catholic, Joe, which has been interesting, especially when I have asked him if he would obey a Christian theocracy, and with Barry, someone who considers religion something other than believing in a deity and worshipping it, the basic definition of religion. That one is a mind-bender and many thanks to my dear friend, Mak, for hosting the discussion. With the weather being unusually warm, we’ve had a chance to grill out a couple of times. 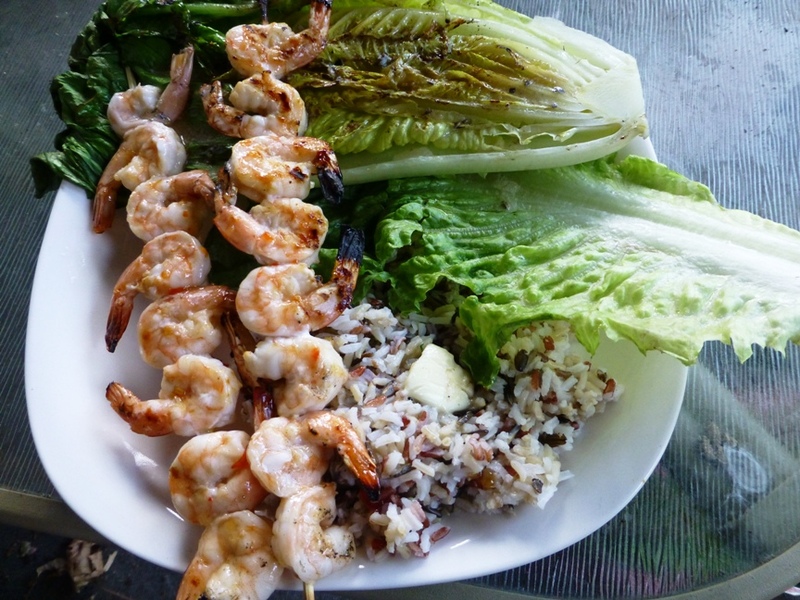 One meal was grilled shrimp, grilled romaine (yes, the lettuce) and a very tasty rice blend, Texmati Royal Blend. We brushed the shrimps with Frank’s Sweet Chili Sauce, and grilled them over a very hot fire for a short amount of time. We also always remove the tails, since saucy tails are rather pointless. I like the sauce since it has a good hit of vinegar in amongst the sweet and heat. The romaine was brushed with olive oil, grilled to get a nice char and then dressed with Gazebo Room Greek Salad Dressing. It’s a Harrisburg original, an oil and vinegar dressing with a fair amount of oregano (I think). I love it on cold cut subs. The rice is Texmati Royal Blend White, Brown and Red Rice, which smells like popcorn when cooking. 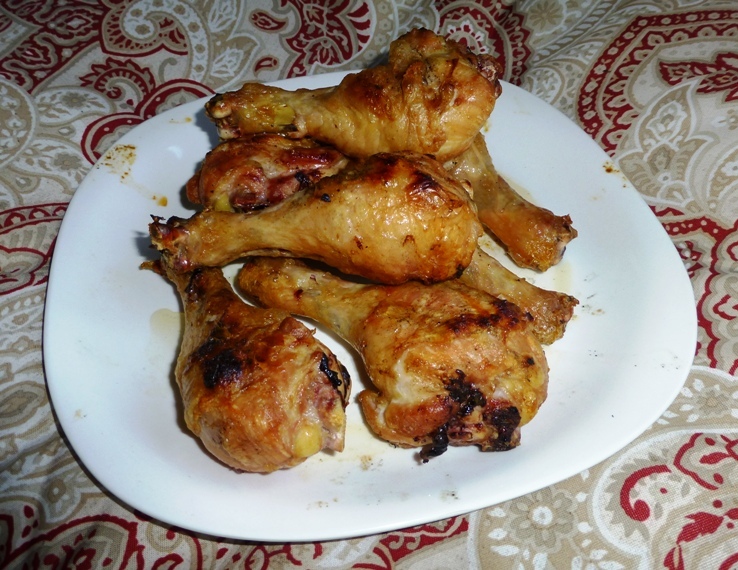 We experimented on another weekend with cooking chicken legs. It is definitely a time for indirect cooking. We built a pile of charcoal in the center of the grill, and arranged the legs around it in a circle, turning them about every 10 minutes for around 45 minutes. It was the first time I actually got a golden brown, not half rubbery and half charcoal skin on my chicken on a grill. While we were cooking one evening, a squirrel decided to join us. 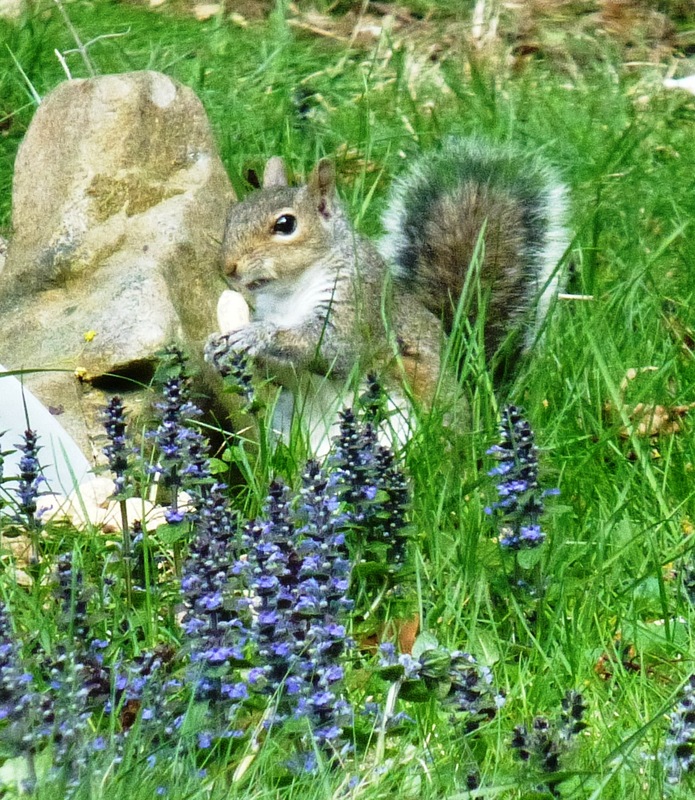 I gave him some roasted peanuts in the shell. We have been restructuring the backyard. 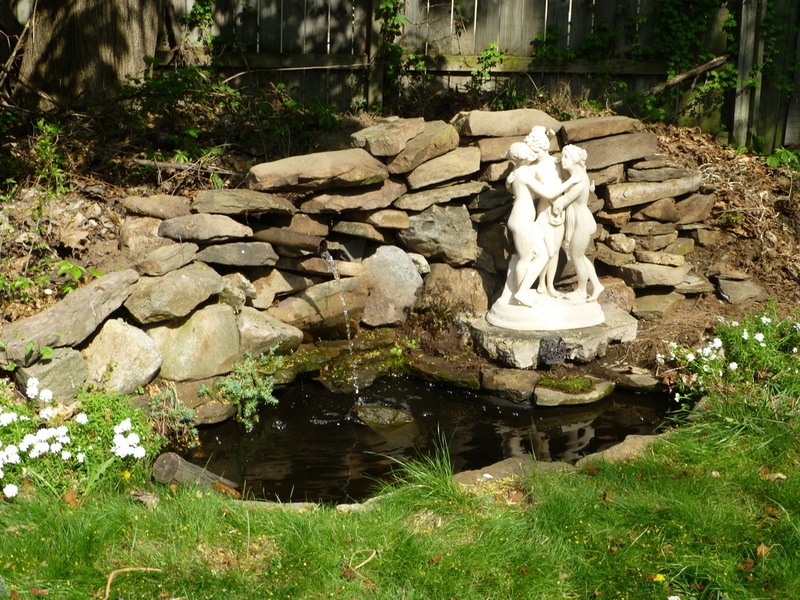 Here’s our new stonewall mostly done, with water pipe and new statue of the three Graces. Watched a couple of movies recently. The newest Godzilla movie is bad. I love giant monster movies, so suspension of disbelief isn’t hard for me. However, this sorry movie had so many ridiculous, LAZY, plot holes in it, it was ridiculous. Same for X-Men: Days of Future Past. I used to be a huge X-Men fan in the 70s and 80s. Nice special effects, utter nonsense for a story. Finally, we had brewed some beer over the winter, the Festivus Ale from Northern Brewing. We put a label with the Krampus on it. It was a Festivus miracle since we got nearly 12% alcohol if our measuring device is to be believed. 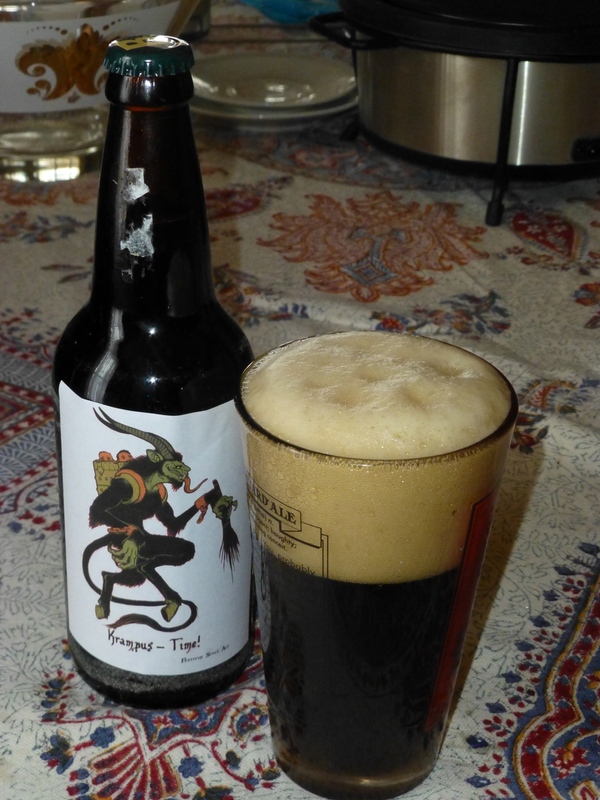 It was a very tasty beer, with fairly sweet with toffee and a good measure of spice. We kept it perhaps too long since it started foaming uncontrollably and did actually blow up some bottles. Glad we had the bottles in a plastic bag lined cardboard box because the glass bottles became bombs, peppering the inside of the box with shrapnel. Here’s a cat picture for good measure.